I've decided to give blogging on a somewhat regular basis a try. Now that I am a part-time SAHM I now see why so many bloggers are SAHM's! We are women and we need to feel connected! Am I right or am I right? Having nothing but Mickey Mouse, Elmo and baby talk for days can wear a girl down! One of the ways we as women feel connected is to "peak" into the lives of other women and see how they do life. 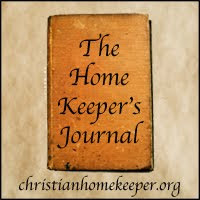 With that said I will randomly partake in The Home Keeper's Journal sponsored by the ChristianHomekeeper.org. This week’s Journal is all about HOME. In my homey kitchen …..There are fresh baked banana-nut muffins and choc chip cookies (cheated on these, they're a mix!) in a container ready for little hands to grab. I have a 5 minute bread batch in the fridge. This bread was probably one of my best Internet recipe finds! Good thing no one here is on a low-carb diet. I also have a partially eaten cheesy-Italian bake in the fridge I made for the guys before I had to work at the bookstore tonight. My thoughts on being at home …… It is a blessing! I remember when Eian was little and actually kind of resenting having to stay home. I missed having "me" time and feeling like I never got anything accomplished but cleaning, cooking, and diaper changing just to do it all over again. I was not a Christian during this period but even if you are being at home is tough IF you lose focus of the purpose. I then went from full-time SAHM to having no choice but to work again full-time in a clerical position. It didn't take more than one time of dropping my baby off to strangers that I longed to be home again! Due to un-foreseen circumstances I worked away from home full-time for the next 7 1/2 years. Oh how I missed being home to where my heart ached for it. But the Lord in His awesome wisdom and love, He knew the perfect time and here we are. I appreciate it so much and see it as a wonderful gift and a high calling to be able to take care of my family. I'm getting choked up as I type this, oh my word! But I love watching Play House Disney and watch my lil guy do his funky dance to the theme songs, picking up toys is a pleasure (yes I said pleasure) because there were lil hands that played with them, and meal planning is so much fun and I love trying new recipes. I also have more time to coupon and get the best deals AND I don't have to shop when all the crazies are out on the weekends! I love being home when Eian's out of school, not to mention being able to attend school functions and volunteer without doing anything short of giving a kidney to get out of work. I love the look on my husband's face when he comes home to a sometimes clean home and the smell of something simmering. Is my life PERFECT because I stay home more? Absolutely not but there is more peace and order to our home. That I like, a lot! A constant habit I have of making my home comfortable is ….keeping it warm and cozy with candles burning and I bake a lot in the winter. But as soon as there's a slight warmth to the air, the windows are opened. I make an effort to at least keep the bathroom clean and nothing smells better to me than bleach in the bathroom! I also strive, as much as one can with an 18month old, to keep things off the floor. I also like to keep clutter contained in lined wicker baskets. You may not find what you're looking for IN them but they look pretty! What I want my children/spouse/other family to remember about my home is …… that it was a comfortable, relaxed place where they could be themselves and feel welcome. So what is your home like and your thoughts about it?